Making other people feel special. Wanting to have it all. The king’s cape and throne are decorated with images of the lion and the salamander, symbolising strength and courage among change and transformation. The salamander biting its own tale represent an Ouroboros. Ouroboros symbolises the ability to re-create yourself. The throne is made of gold symbolise prestige. The king’s crown is the shape of flames symbolising the passion for prestige. The wand in his right hand symbolises ideas and ambition. The king’s lion necklace symbolises courage. King of Wands tarot card often denotes someone who is married with a family. This is someone who is a natural and charismatic leader. 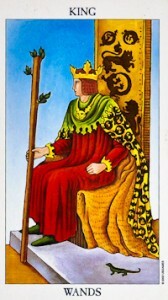 King of wands indicates entrepreneurial skills and running new and exciting projects. This card can represent an industry leader and to be an expert, especially in media and communication. This card signifies being passionate about life. King of wands people don’t do well with compromises and neither will you if this card represents you in a reading. In situations King of wands means leadership, commitment, getting recognition, success and doing the things that make you tick. In a love reading, King of wands tarot card can mean the seeker is falling in love with someone who is committed elsewhere, and they are playing with fire. King of wands can also speak of a relationship that is fun, but at times also very demanding, and other people can try and interfere with your relationship, creating some jealousy. King of wands tarot card signifies careers in media, technology, and business owners. King of wands often speaks of meeting someone in a career that makes work so much more fun and worthwhile. This is someone who leads through a great heart and plenty of passion. King of wands as feelings speaks of feeling powerful and grateful in a wonderful mix. This is power that heals. If you get King of wands reversed it speaks more of corruption, however, King of wands upright speaks of wonderful feelings of empowerment. If you are asking how someone feels about you, King of wands can mean this person feels you are a force to be reconed with and this person most likely has a lot of respect for you. This person could also feel you are irresistable. Learn what King of wands tarot card means in the Grand Tableau. King of wands is the king of cool. This is someone very exciting. A powerful risk taker, King of wands people have plenty of healthy confidence. It is the kind of confidence that makes other people feel confident too. They make great leaders and people are drawn to their magnetic personalities. They have a real talent for making others feel special. This is someone very driven and magnetic. They have a genuine concern and consideration for other people’s well-being. They love to invest and they love to push themselves to go further. With so much to experience, they want to have it all. 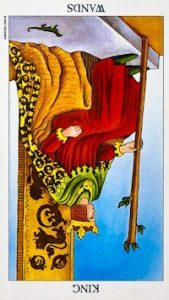 King of Wands tarot card reversed indicates at worst dictatorship, and at best complacency. This card can often show up when someone around you has a bad temper, often very violent. Sometimes this card shows up when someone lives a double life, they are prince charming to the outside world, and at home, they are terrorising their families with their temper and control issues. If not a person, this card reversed indicates red tape, fear of taking risks and poor leadership. On a lighter note, this card shows up reversed when the Seeker is under-appreciated in their career and/or family life, and they need to absorb the energies in Queen of wands. They need to let people in and let them love and nurture them. The Seeker might have been pushing people away for so long they end up feeling completely alone. King of wands tarot card reversed indicates someone who needs to learn to control their temper. They have too much ego and expect everyone to tiptoe around them and cater for their every need. King of wands reversed people have difficulties taking responsibility for the state of their relationships and often blame everyone else if something goes wrong. This card also shows up reversed when someone is being unfaithful, and they are out of integrity. They are often very vain and believe themselves to be much better looking than what they are in reality. At worst this card describes someone with the habit of believing everyone is secretly in love with them. They only want to talk about topics they are interested in, which usually involves talking about themselves. At times, they are shameless and promiscuous, and they often have a drinking problem. They exaggerate their own importance and brag continuously. Some of them have even worse problems and become violently dangerous and unstable. At best this card describes being a notorious under-achiever. They hide who they really are because they don’t think others will approve. King of wands + The Magician: Success in business. King of wands + The Emperor: Self-Employment. King of wands + The Sun: Parenthood. King of wands + Six of cups: Your siblings. King of wands + Knight of cups: An actor. King of wands + Two of swords: A scientist. King of wands + Four of swords: A doctor or healthcare professional. King of wands + Page of swords: An investigator. King of wands + Seven of pentacles: A farmer. King of wands + Ten of pentacles: Your father or grandfather. King of wands + Nine of wands: Being in demand. Your expertise is needed. King of wands + Page of wands: A social media expert. King of wands tarot card denotes natural leadership. King of wands sometimes shows up when you are interacting with authority figures. It is wise to let them help you. King of wands is also the tarot card for achieving. The best thing you can do is to focus on yourself. Compete only with yourself and you will be amazed at how far you will go. Click on text to learn more about what King of wands means as a final card in a tarot reading. Learn the Meanings of King of Cups, King of Pentacles, and King of Swords.